Arima Onsen:One of Japan's oldest hot spring. 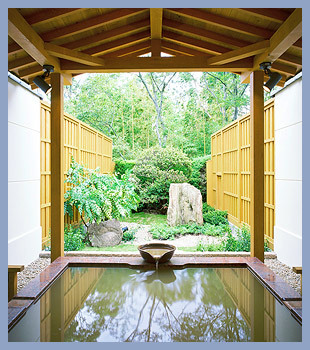 One of the things to be enjoyed at a hot spring ryokan, is of course, the hot spring bath. No matter what culture you are from or what language you speak, everyone can enjoy a large public bath. Hot springs are good for your health and help your mind and body relax. 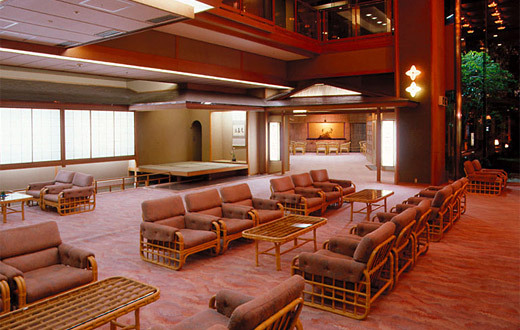 Arima Onsen is one of Japan's oldest hot springs. In Japan's oldest document 'Nihon-Shoki' it is mentioned a record of the Emperor staying at Arima Onsen in 631 AD. There are 9 known properties that hot springs are known for, and the hot springs here have 7 of them, truly a rare feat. The "Golden Spring" of Arima Onsen has a high concentration of iron and sodium. The spring water is clear, but it turns reddish brown as it contacts the air. At Hyoe Koyokaku, you can enjoy this "Golden Spring" at all three large public baths. The beautiful traditional gridded ceiling gives off a harmonious atmosphere in the bath. There are indoor and outdoor baths where you can enjoy Kinsen- Golden Hot Spring. The "Ichi-no Yu" and "Ni-no Yu" switch between genders daily. This bath's distinctive feature is that of its Roman-style interior. The washing space is vast and relaxing. There are indoor and outdoor baths where you can enjoy Kinsen-Golden Hot Spring. Open the glass door separating the indoor and outdoor baths, and you can make it a vast half open-air bath. This bath is made of wood and gives off a warm feeling. *1. San-no Yu has separated baths for men and women. *2.Private open-air baths (require reservations)are also available. Enjoy the Golden Spring in a private space. 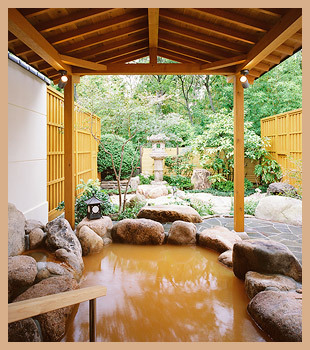 You can enjoy the "Golden Spring" at the open-air bath with a garden where you can experience Japan's four seasons. 8:00 to 9:45, 14:45 to 22:15 (Last entry) * Requires reservation. *Private open-air hot spring baths (additional fee・advance reservation required)can be used only by our guests who booked a stay plan. ※Large public baths can be used by guests who booked a stay plan or a day trip plan. This is a foot bath using spring water from the Golden Spring. Enjoy the scenic view as you take a quick dip. * Unavailable during winter and rainy days. 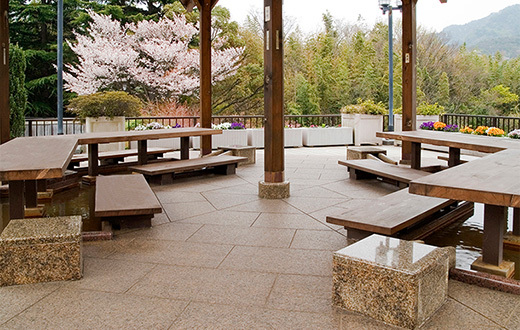 We hope you will relax in the rest area where you can view the carps and garden. Between 16:30 and 18:00, we have complementary tea made from powdered kelp and pickled plum. Acute illnesses (especially fevers), tuberculosis, malignant tumors, serious heart diseases, respiratory failure, kidney failure, acute hemorrhagic disease, acute anemia, any other progressive disease. *At Hyoe Koyokaku, we kindly ask the following persons to refrain from bathing at the large public baths. Our large public baths can be used only by our guests who booked a stay plan or a day trip plan. Our private open-air hot spring baths (additional fee・advance reservation required)can be used only by our guests who booked a stay plan.